Whether you live in South Florida, are visiting the area for a vacation, or are just here for a day to connect to your flight or cruise, this much is true: There's a ton of outdoor activities to enjoy. Which South Florida outdoor activities are your best bets besides the standard ones like tanning at the beach, jumping in the pool, or fishing? Let's have a look at SoFlo's best bets that will give you the most bang for your buck. Great views? Check. Near the water? Check. An experience you can brag about to your friends that most have never done? Check. You can parasail out of Ft. Lauderdale to see Broward County's beautiful coast from an entirely new perspective that's usually reserved for the pelicans and seagulls. Up to three people can go up in the air at a time, and yes, it's perfectly safe. As an added benefit, Fort Lauderdale Parasail offers other outdoor activities once you land from your quick trip above the water. You can rent jet skis, boats, and even kayaks if you're seeking more relaxing, less adrenaline-pumping fun. In short, it's a good idea to plan an entire day if you're checking out this SoFlo outdoor attraction. Enjoy all of Key Biscayne's beauty by renting a quad bike at Bill Baggs Florida State Park. The quad bikes are spacious and can seat two adults and two small children, and they give you the opportunity to get some exercise, bond with one another, and soak in the scenery. Beyond biking, the park allows you to fish, relax on the beach, picnic, hike its nature trails, view wildlife, and swim. You can also see the Cape Florida Lighthouse, which holds a spot on the National Register of Historic Places and is famous for being the only lighthouse to be attacked by Indians. 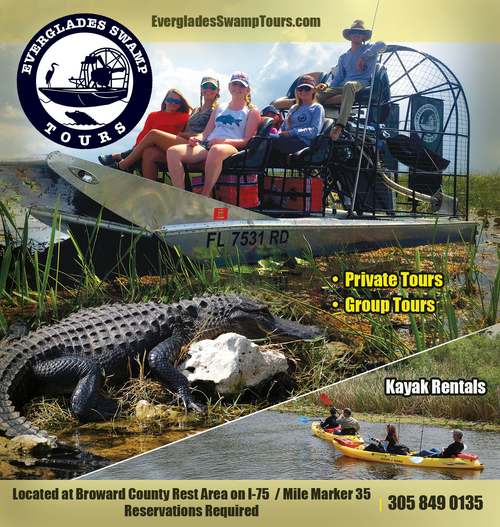 When it comes to SoFlo outdoor activities, it doesn't get more "outdoor" than the Everglades. You could spend days here hiking through all the nature trails, riding bikes, taking airboat tours through the swamps to see alligators and other native South Florida wildlife, and more. If you have the time, plan a full-blown camping trip in Everglades National Park. Don't forget the bug spray or sunscreen though, as you truly are immersed in pure nature here. Out of all the South Fla. outdoor activities on this list, this may be the one your little kids will enjoy most. Fun for the whole family awaits in this popular tour that has you set sail in the search for treasure on the Intracoastal. The cast of the cruise goes all out to talk and dress like pirates, and they'll help all travelers do the same. Along the way, there'll be battles with water cannons, plus plenty of sightseeing of Broward County's most elegant mansions and yachts. If you have a little one's birthday coming up, this on your to-do list. Stuck up north in Palm Beach County near Boca Raton and don't want to make the drive down to Broward or Dade? No problem! West Palm Beach and the surrounding areas have their fair share of SoFlo outdoor activities as well, and DivaDuck Amphibious Tours is one of the best. Kids and adults alike will enjoy this 75-minute tour that spans land and sea via the DivaDuck amphibious vessel. You'll see plenty of Palm Beach historic sites, waterfront mansions of celebrities, and, of course, the natural beauty of South Florida along the way. You won't endure any awkward silence either, as the tour guide will fill in the trip with a bevy of jokes, historical facts, interesting stories, and music to keep you entertained. All the animal lovers in your family will love the time they spend at McCarthy's Wildlife Sanctuary. A whopping 200 animals call these eight acres of palmetto and pine forest home, including black leopards, African lions, white tigers, and even ligers. You can get super-close to these fantastic creatures - up to four feet away! Want something more hands-on besides just witnessing the wildlife? There's plenty of that at the sanctuary too. You can pet and handle parrots, alligators, snakes, kinkajous, and much more. As for the best part of the sanctuary, it was created to make a home for injured native wildlife, unwanted exotic pets, and orphaned babies. In other words, your spending your hard-earned cash here serves a great cause. Could this list of amazing outdoor activities in South Florida keep going? Of course, but what you see up above is a good starting point as you plan your upcoming itinerary. You can also find many more activities and attractions in So Fla. by browsing our site.